I have been looking forward to visiting Rome for quite some time now. I am not, however, the biggest fan of extremely over crowded with tourists type of places. Therefore, we booked just two nights there. It was a whirlwind. On the first evening, we saw the Capuchin Bone Church, The Pantheon, and The Trevi Fountain. Let me just say, the bone church was insane - you can’t take photos in there, but after the museum there is literally a crypt with hundreds and hundreds of human femurs and scapulas. Cool, but eerie. The Pantheon was beautiful and old and right in the middle of the city. The Trevi fountain was on a whole different level. You'd think it was the most important thing in Rome with all of the people that were there, even at 7 o’clock at night. Still glad we saw that recently-cleaned-by-Fendi masterpiece. To end the night we went to the famously hip district of Trastevere for dinner. There we had the best pasta we had eaten yet at a family owned and ran little restaurant where there were no tables outside so they carried one from inside outside, just for us. They were far too busy and also far too kind, so we didn't care a bit. We had a delightful candlelit dinner. 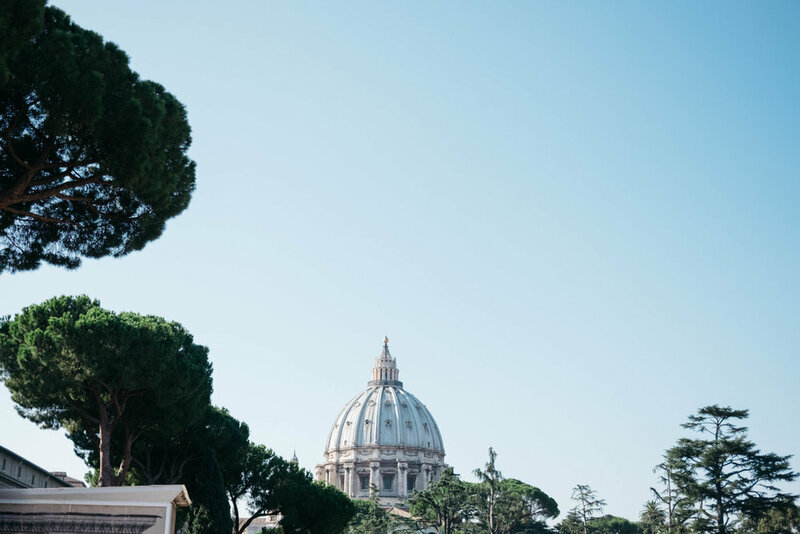 Before we arrived we decided it would be best to do a guided walking tour when we went to all of the major sites; The Colosseum, The Vatican, Palatine Hill, and The Roman Forum. We wanted to make sure we were getting to learn about the History of Rome and not just look at it, say “cool,” and move on. So on the second day in Rome we got up and took the metro straight to The Vatican for a 9 am tour. Even seeing it from outside was amazing. The whole thing was walled and had guards at every entrance. I mean, it is literally a city inside a city. Within The Vatican we saw The Sistine Chapel, St. Peter’s Basilica, countless works of art, tapestries, and historical artifacts. The tour we did was with only about 20 other people and the guide spoke perfect English. We learned so much, which was the goal. With each work of art we walked past our guide, Sara, explained what was going on in the piece, what the intent was, what the symbolism was, and what the artist was trying to relay. Before we went into the Sistine Chapel, she explained exactly what we would be looking at, a sort of preparation for the incredible work we were about to see. 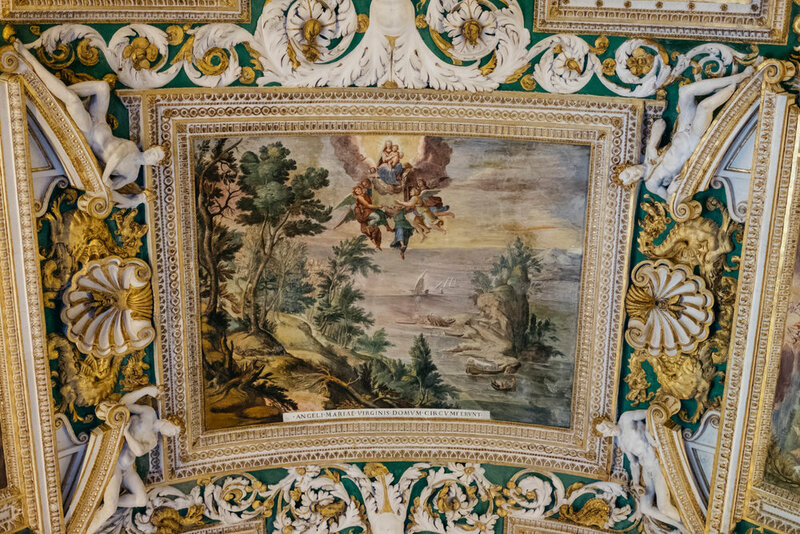 She also explained the story of how Michelangelo came to paint the ceiling, how he was a sculptor, not a painter, and how rocky the relationship was between him and the pope at the time. So many interesting details we learned and I could literally write a novel on it all. We were so glad we had a guide telling us what we were looking at. 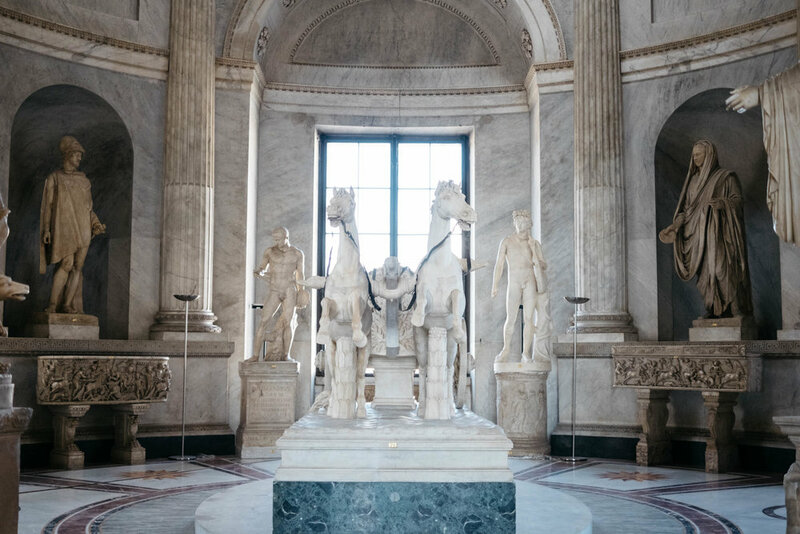 She also told us that if we were to look at each piece of art in The Vatican for a total of 60 seconds it would take 12 years to see it all That helped when I kept thinking, I wanna stand here longer and really look at the detail of every painting, I realized, I would have to live here to do so. This made me feel better about not seeing every single one. It was so special to walk through this place - knowing the significance of what I was looking at, the gravity of where I was. 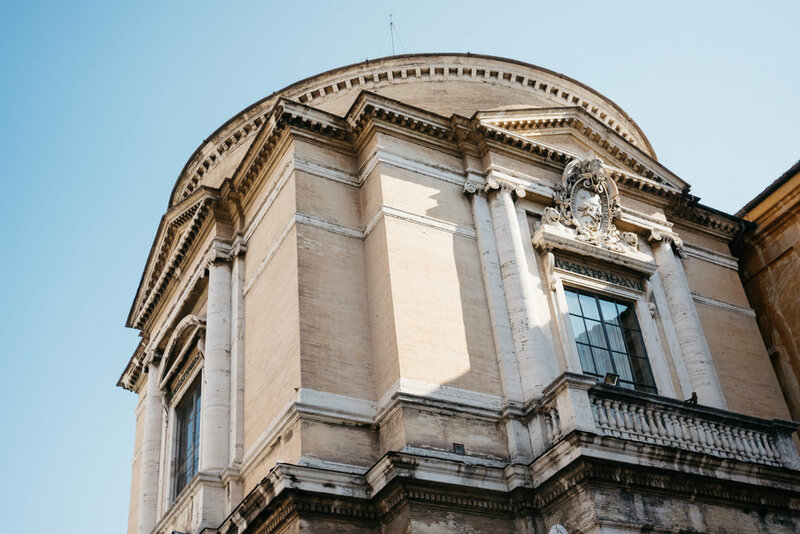 The thought that many Pope’s and influential leaders in the Christian church had stood there too made it even more powerful of an experience. You don’t have to be Catholic to see this significance. It was beautiful, rich, and enriching. Next we took the metro to the Colosseum. You literally walk out of the metro station and there it is, right in front of you. What a sight - one I will not soon forget. 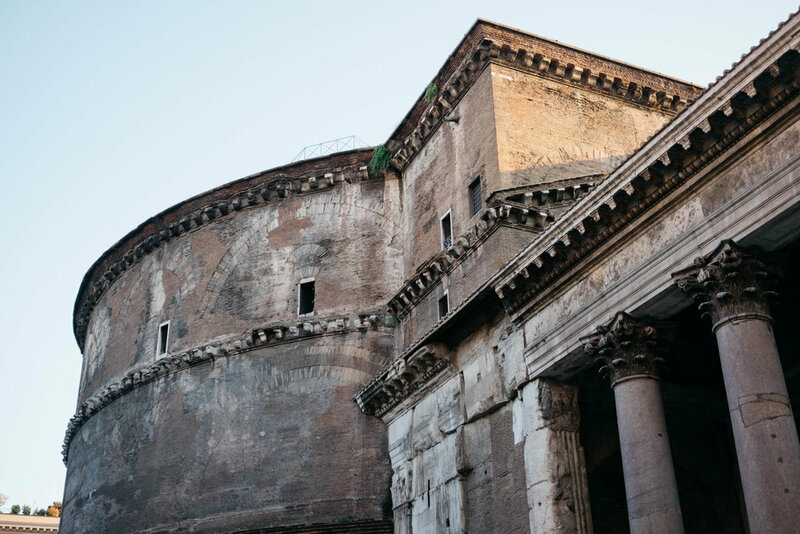 We were starting the second part of the tour and this time we were going to learn about the Colosseum, Palatine Hill, and The Roman Forum. I thought I was most excited about the Colosseum, and it was pretty spectacular to see and learn about, but Joel and I both enjoyed Palatine Hill and The Roman Forum much more. Seeing where the Romans lived and where the mansions and markets were just left us speechless. So much to fathom - that people lived in these very buildings more than 2000 years ago and we were looking at them presently. It was honestly quite more than I could comprehend. I love things that stretch my brain like this, really make me think and wonder. Walking through the ruins of this old city, imagining what it would have been like for them all those years ago, and hearing the history that the guide gave us was such a treat. All that to say - we really enjoyed having a guide for our walking tour. We definitely felt that we wouldn’t really have learned anything if it were not for the guides. Of course, we would have been visually satisfied, but really wouldn’t have known what we were looking at. So glad that we just decided to go for it and spend the extra money to learn and, of course, not wait in any lines. At the end of this day, we went to the metro to go home and Joel realized he didn’t have the key to our apartment. Instantly I remembered thinking I thought I heard something fall from the x-ray machine conveyer belt in security at the Vatican. They didn’t have baskets for your wallet, phone, and keys, you just lay everything on the belt and Joel emptied his pockets, walked though and picked his things up. I said to him, "did something fall?" because I thought I heard something. He didn’t respond and I assumed that meant no, but really he didn’t hear me then. So we were contacting our Airbnb host, trying to see if he had an extra key or not but he wasn’t sure he did. The thing is, when we got to the apartment in the first place the key cards - like in a hotel - weren’t working so he gave us the master back up key. This is what had fallen through the belt. All this meaning, there was quite a bit of stress and hurrying to try to find out if we could somehow get the key back at the Vatican. Joel looked up their hours and, of course, they were closed. They had closed at 4pm, it was now nearly 7pm. He didn’t care, wanted to go there anyways, and although I was pretty confident it would be there, I thought it was stupid to go all the way back to a place that is definitely closed, and one of the most secure places in the world. However, when Joel’s stressed, I do what Joel wants and don’t ask questions or contest. So we walked back and when we got to the walls there were, as usual, guards with automatic assault rifles off to the side. Usually in this case Joel would stop and tell them what was happening and ask if he could possibly go inside and try to find the missing key. In this case Joel headed straight for the door, that just happened to be propped open, probably due to heat. I decided it would be best for me to stand down at the bottom of the stairs and act like I didn’t know him. As soon as Joel approached the door someone came straight to him and basically asked what he was doing and what he needed. He explained the story to the man working, kind of like a mall cop, and the man was quite skeptical. He said, “okay- you wait outside, I’ll go look.” So Joel paced at the top of the stairs and I sat at the bottom, trying to just distract myself on my phone. After sitting there for a bit I realized, if they don’t find the key Joel is going to be a nervous wreck, so I said a little prayer and hoped they would find it. Not even a minute later the man came outside with the key and Joel nearly kissed him. As soon as we started walking down the stairs, they closed those front doors. If we had come even a few minutes later we wouldn’t have been able to get in and our night would have been quite different. We walked back to the metro and then back to the apartment victorious, Joel was so relieved, and I was relieved that he was relieved. Hey, it made for a really good story and, in hindsight, an even better adventure. Metro rides, another tiny apartment with a loft, lots of big historical sights, lots of learning, really long really really hot walks, and really really really good pasta - Rome, even for just a day and a half, served us well.